The data on the School Report Cards allow us to estimate the score boost the State gives the Richmond high schools by pretending that Maggie Walker is not a school. The report card for each school gives the ADM (educratese for enrollment), the test score, and the % of kids tested. Multiply the ADM times the % tested to get the number who took the test; multiply that by the pass rate (the score) to get the number of kids who passed the test. The report card further gives the number of students who are at the Governor's School. We can safely assume that all the Maggie Walker students passed so we subtract the number of Governor's School students from the total number who passed and we get the number of students at the high school who passed. Whew! Almost there. Next we take the number who took the test and subtract the governor's school number to get the number of students at the school who took the test. Divide that into the number of students at the high school who passed and you get a corrected pass rate that reflects the actual performance of the high school. The difference between that corrected pass rate and the (fudged) pass rate reported by the State is the score boost. Note: This assumes that all the kids in the high school are tested for both English and math every year. Generally that is not the case so the numbers calculated here are low estimates. The ordinary student will take only the EOC English test, so the actual boost for English could be as much as four times the estimates calculated here. If all the students were to take only the required three math courses, the math boost would be about 4/3 the boost estimated here. Armstrong is missing from the table because the number of students in the Armstrong district who attended the Governor's School was so small that the State declined to report it (privacy concern). We can infer that any boost at Armstrong was quite small. At the remaining schools, the boost ranges from 0.5 to 1.2 points, with Thomas Jefferson the big winner. If you think half a point or a point might not be a big deal, notice that Richmond was eight points below the state average on the English test and nine below on the math test this year. In that context, a point, or even half a point, is a nontrivial difference. 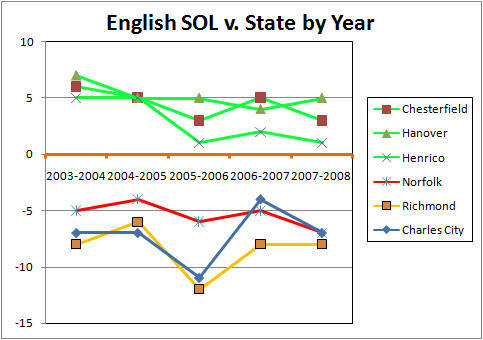 Turning to the suburban high schools, the Hanover, Henrico, and Chesterfield high schools, with one exception, all score ten or more (generally many more) points above the AYP objectives for the 2007-08 testing, 77 in English and 75 in math. The exception is Chesterfield's Meadowbrook High, which had a 76% pass rate on the math test, one point above the AYP criterion. The boost on the math test for Meadowbrook was 0.5%, so even with the most pessimistic assumption about the roundoff (74.8 score + 4/3*0.5 boost = 75.5 boosted score ==> 76 reported) the school did not need the VDOE's secret score boost to make AYP. Charles City High scored 77 on the math test but had so few students at Maggie Walker (actual number not reported because of privacy concerns) that the boost there likely was negligible. 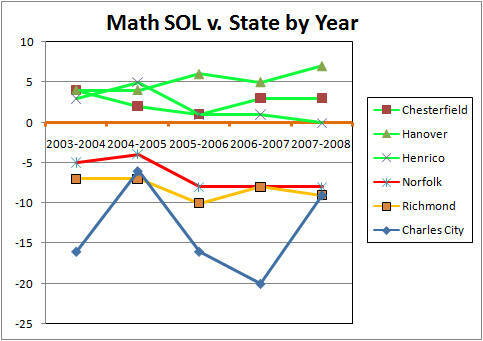 Thus VDOE's dishonest score boost does not appear to have helped any of the nearby high schools this year. But stay tuned, the baroque and profoundly dishonest accreditation process starts out with these bogus scores, which provide yet another secret boost to the accreditation calculation. There is another boost that may be less obvious (hat tip to Carol Wolf for pointing it out). To make AYP, the school must test 95% of the students in each group on each test. All of the Maggie Walker kids were tested so they boosted the % tested at the high schools that tested fewer than 100%. As you see, Huguenot, Marshall, and TJ were so far above the 95% line that they needed no boost; Wythe was so far below the line that even the boosts there could not make a difference this year. Indeed that appears to be the lesson here: The State's fabrication appears to not have helped the beneficiaries this year, at least as to AYP. If that result generalizes, it would suggest that the VDOE is being dumb, as well as dishonest.